Josh's injuries resulted from a fall in which he was impaled on a steel pipe at his workplace at the time. I will never know how he pulled himself off of that and stayed so calm until the ambulance got there. We arrived Iowa Methodist from Broadlawns Hospital about 5:00pm. They moved Josh upstairs and prepped him for surgery. After hearing what the doctor had said (had no idea how he was still alive with such injuries) I was terrified that we were going to lose Josh. Obviously, I knew he needed the surgery, but I was afraid to let him go, worried that it would be the last time I would see him. So into surgery he went. There were two surgeons needed, a trauma surgeon and another surgeon the specialized in urology. His surgery seemed to last forever! The reconstruction on his bladder was preformed first. That surgeon came out and explained to us that he had to remove Josh's bladder, slice it open laying it out flat on a table, repair the holes, then put his bladder back in and "reconnect" everything. The trauma surgeon next repaired the tears in the colon. Josh ended up having to have two catheters; a super pubic (coming out the side of his body) and a foley catheter. He also had to have a colostomy bag as his colon needed time to heal. Josh came out of surgery around 1:00am on Saturday morning. After spending time in recovery Josh was moved up to ICU. I couldn't help but remember that just a few years before, our nephew Brian was in that same hospital in the same ICU unit. Unfortunately, Brian did not make it. I know how hard that was for Dennis' sister and her family. Josh's arrival in ICU was made more stressful by a nurse that had absolutely no bed side manner she was rude, bossy and down right nasty. I talked to the doctor demanding that another nurse be assigned to Josh and when Dennis and I were approached by the nurse, I let her have it. Maybe it was the situation, maybe it was the lack of sleep, but there was no way she was going to treat our son that way after everything he was going through. Needless to say, we didn't have any problems with his nursing care after that. Josh was moved out of ICU later that Saturday afternoon. 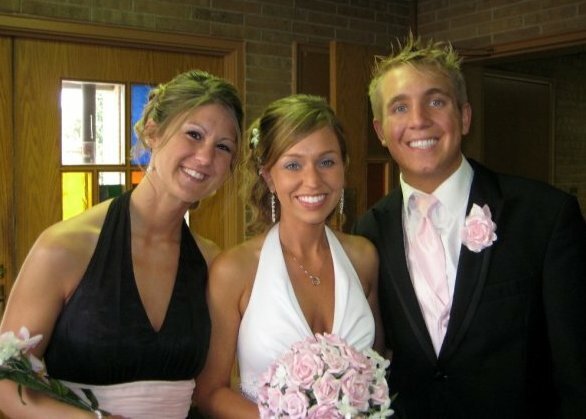 Mollie called every few hours checking on Josh, even during the time when she should have been walking down the aisle as a bridesmaid at Rachel's wedding. Kristyn brought Kaydin back to the hospital. She spent everyday there during Josh's stay. (Kaydin was between daycares since she was supposed to be back with Mom at their house that week while Dad, Josh and I were in Florida and when we got back we were moving so she was starting a new daycare) She was so good and she was quiet while Josh slept, often taking her afternoon naps on a blanket on the floor. Dennis spent that Saturday night at the hospital even though he had not had any sleep either. He wanted me to take Kaydin back to the house to sleep. Mollie was still at the wedding, but calling back frequently to check in on Josh. The next day, Sunday, I got up early packed Kaydin up and went back to the hospital. Mollie arrived shortly after I did. We had numerous calls from family and friends and kept them posted but that Sunday we also had our first visit from family members, the aunts Irene, Kathy, Joan, and Linda, and cousins Angie and Stacy and her kids. It was also Josh's first time out of bed. I thought it was too soon but we all know the hospital likes to get them up and moving ASAP. And so it began Josh's roller coaster recovery. Some days were really bad for him, terrible pain! He was on morphine. Sometimes, it helped and sometimes it didn't. One particular day Josh was really upset, but he didn't open up and talk about it until later that night, finally he told me that one of the doctors told him that he might be stuck with the colostomy bag for life. I was blown away, I didn't know what to say, I was so angry that he was told something like that. I told Josh that that was not going to happen, and when the doctor came in the next morning I demanded that he tell me who the doctor was that told Josh that. I was somewhat embarrassed when Josh said, "Mom, this is the doctor." I soon got over that and told him that my son was not going to have a colostomy bag for the rest of his life. We spent all our time at the hospital . Dennis spent two weeks in Des Moines, dividing his time between being at the hospital and helping Mollie move, which happened to fall during this same time period. Josh was so drugged up during the first two weeks in the hospital that he doesn't remember much. But when he was becoming more coherent he was so ready to get out of the hospital, he was becoming so bored and complaining about still being there. I personally wanted Josh to stay in the hospital, I felt safe with him there knowing he was getting the care he needed. I was scared to even think about when he would be getting out. But after 2 1/2 weeks Josh was released. He was happy but I was worried because his injury was so severe. I knew he had a long road ahead of him. And even though I knew how strong he had always been, I knew he would struggle physically and emotionally to get through it. Such a crazy couple weeks! I do remember calling Mom many times to keep getting updates. I really wasn't worried, though, even as he was in surgery for hours. I just knew he was going to be ok. On Sunday morning after the wedding, Adam Tucker (an usher in the wedding and who I traveled with) and I hit the road early so I could get to the hospital. I was excited to get back there and spend time with Josh and also get all the details to what had been happening the last two days. I spent as much time as I possibly could at the hospital, taking many days off work during this time (I did already have vacation days scheduled since we were supposed to be in Florida). I even spent the night at the hospital with Josh once or twice. He didn't really enjoy me staying with him, though, because I got tired and went to bed early. It was really hard for him to sleep in the hospital so he got bored once his visitors went to sleep. To add to the craziness of these two weeks, Kaydin and I were moving to an apartment. I guess it worked out that Dad was down here with me and we could slowly move my smaller stuff. Tim also pitched in and we had the house emptied in no time. It definitely wasn't something I wanted to deal with though with so many other more important things that were on our mind. It worked out that I think we moved me at the end of Mom and Dad's stay in Des Moines, so we still had the bigger house and more room while they stayed. After Josh was released from the hospital and Mom and Dad went home, I was at his house almost daily to check in, deliver medications, and also take him to and from doctor appointments. We spent a lot of time together during that time, although, not for the reasons we would have liked to. 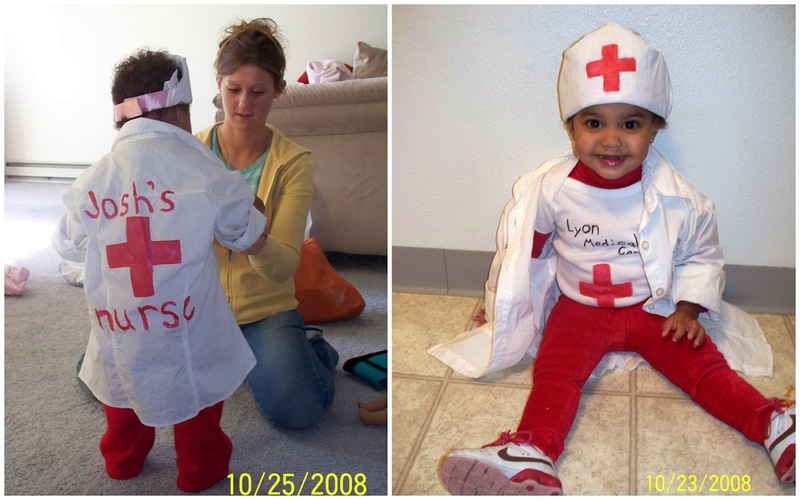 Halloween of 2008, I decided Kaydin would be a nurse. More specifically, Uncle Joshie's nurse! It was fun that year to participate in all the Halloween activities together. Josh couldn't be mobile for an extended period of time,though, so wheelchairs helped us during all our outings during this time, even short ones to the grocery stores.